Diesel Plug-In Hybrids are very rare beasts, but now there’s a new entrant to the market, the 166mpg E 300 Mercedes -Benz de Saloon and Estate. The aim of a Diesel Plug-In Hybrid is to provide a vehicle that is economical on long journeys, but with zero emissions for local driving. Despite the Plug-In Hybrid market still being at relatively low levels of sales, the UK government has ceased the plug-in car grant for PHEVs. The E 300 Mercedes de Saloon and Estate are powered by a 2.0-litre diesel engine which produces 194 hp and 400 Nm of torque and a hybrid module with 122 hp of electric power and 440 Nm of torque – with a combined system output of 700 Nm. 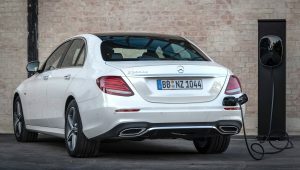 The E 300 de has a fully electric range of 34 miles for the Saloon and 32 miles for the Estate. It has a battery capacity of 13.5 kWh and can be charged from 10 to 100 per cent in under two hours with a 7.4 kW charger. The E 300 de can achieve 166.2 mpg on the combined cycle and emits 41 g/km of CO2 (44 g/km for the Estate). It has a 0 to 62 mph time of 5.9 seconds (6.0 seconds for the Estate) and has a top speed of 155 mph. The new E 300 de Saloon and Estate are available to order now, with first deliveries arriving in spring 2019, with prices starting at £47,700 for the Saloon and £49,700 for the Estate. Should you buy a plug-in hybrid – especially as the plug-in car grant incentive for PHEVs has now been stopped? If you mainly drive less than 30 miles between charges, with occasional longer journeys, then plug-in hybrids can make sense. If you drive on longer ‘occasional’ journeys, then a diesel PHEV should deliver better economy. Read our review of the Audi Q7 e-tron Diesel Plug-in Hybrid. Many people have bought plug-in hybrids over recent years to benefit from low Benefit in Kind company car tax; in many cases, because they don’t pay for their own fuel, drivers have not charged their PHEV. This obviously defeats the point of a PHEV and will result in poor fuel economy. If you primarily drive long distances up and down the nation’s motorways, a diesel is likely to be the most economical option. And take a look at our ‘Which vehicle is most suitable for you?’ video.